Spocks " Live Long and Prosper " Greeting.
" What can I introduce into the show (Star Trek T.O.S.) about my my character? -What are we going to discover about vulcans?- What will we learn about them? We need to do something special when vulcans meet each other"
"Well we have this greeting scene, T'Pau meets Spock on Vulcan. (Shes the Matriarch) Military people salute, people shake hands, what do vulcans do?" stated Leonard. 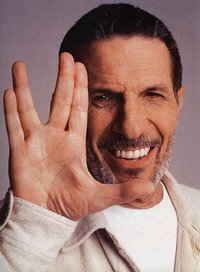 Have you ever wondered where the "live long and prosper" Vulcan Greeting, Earths equivalent of the handshake originated from? Leonard Nemoy described how when, he was a kid between 7-8 years old, he used to go to the synagogue with his parents during the high holidays and sit with his father, grandfather and brother downstairs in the in the orthodox hall. "There was a point in the ceremony when the Kohen (Priest) got up to bless the ceremony. Then 6 to 7 men, the Kohanim (Priests) got up on the Bimah (location from which worship is led) to bless the congregation. But they did'nt just bless the congregation, they blessed the congregation!" "The chanting began and the Kohanim with their special cloaks over their heads blessed the congregation. This was a very special occasion." Leonard demonstrated this for everyone at the gathering. It was very unexpected. He had a special cloak on standby which he put over his head and held up his hands with the cloak resting over them. He made special sounds and gave the blessing. (I felt genuinely awed to have witnessed this. I watched something of such special, deep significance to Leonard Nemoy and he chose to share it with the fans, so openly. Wow. This was a rare occasion. The video had drawn me in and I actually felt part of something special. "It was quite an event." Nimoy's dad said "don't look " and of course Leonard being a curious kid naturally did and survived. "The belief is when the Kohanim do the incantation of prayer the Shekinah (Divine Presence) enters the hall. Everybody in the hall had their heads bowed over so they could'nt see. The image is so powerful, Shekinah, you don't look, dare look to save your life. This is a very important ceremony. I peeked and survived". "Diligent practise and self denial" and smiled with a pleased look on his face. They say seeing is believing well, I'm guessing that our Science Officer practised the Vulcan " Live Long and Prosper" splayed fingers until he had it down pat. Even though i could'nt see the gathering of people on the computer screen from where i was smiling, i could tell they were doing it too and i could hear laughing. Leonard Nemoy was so genuine, only he could have enlightened people, entertaining and expanding their minds in such an enjoyable way. "Okay" was the green light. The big go-ahead. Leonard Nemoy recalled what happened next, rather emotively.
" So we had to get it into the show, this felt right, we just had to get it in there. 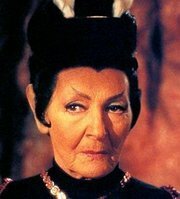 So we went to Celia Lovsky ( actress playing T'Pau, the ruling matriarch of Vulcan. At the time she met Spock in " Amok Time " she was a high priestess carried in on a chair. This was the episode Leonard spoke of. The first ever greeting between vulcans was premiered here. ) and we told her what the plan was, Leonard will do this and you'll do this. She could'nt do it!" "Not everyone could, she did'nt have the years of diligent practise and self denial like I had" jested Leonard. "We showed Celia how to do it, (The Vulcan Live Long and Prosper Greeting with splayed fingers), with the help of her other hand, out of sight of the camera. When i raised my hand she raised hers. Thats how we got her onto the show." Thanks for reading this far. Live Long and Prosper! Here is a shapely, seductive green skinned Orion Woman wearing a skimpy seductive costume. She's also wearing a golden sapphire necklace and bracelets, worn for the purpose of enhancing her appeal to a prospective suitor. Orion Women were said to have the power and seductive charms to delight any male under their influence. Image owner/creator: Paramount Pictures or CBS Paramount Television. In 23rd century humanoid females of this kind were a precious commodity and were marketed in disreputable parts of the galaxy. This trading suggests ownership and as a result of this some Orions were not treated with the respect they deserved. In the episode "The Cage" (Star Trek) Vina appeared to Captain Christopher Pike as an illusionary youthful Orion Slave Woman in order to break his resolve. Actress Majel Barret was painted green for the initial makeup trials of the Orion woman. After the shoot took place and the film came back from the photolab there was no green skin. So, it was concluded, we'll just put on a darker green. The film came back and there still was no green skin. The make-up artists made her an even darker shade of green. When it came back, no green skin. Finally someone had the bright idea to ring up the photolab and say "You do know we want her Green and yet the film keeps coming back with pink skin!" It turned out the lab technicians were completely unaware of this and had been changing the skin from green to pink the whole time! Scientists have made a new discovery in Denmark involving Teleportation, using light as a carrier of entanglement. We're getting closer to seeing , Star Trek Technology becoming Star Trek Reality with every passing year. You can read the article " Teleportation is coming" at the Observer2020 Blog. It turns out that teleportation is'nt so far fetched after all. Its a work in progress. Observer2020 It even mentions Star Trek and its association with Teleportation in the CNN link. In the episode "Sarek" Ambassador Sarek and his wife Perrin joined hands when they beamed off the Enterprise. Luckily the transporter pad still worked properly and transported them over with their hands intact to the cargo transport ship. Teleportation events date back in time to the year 1593, October 24th. The phenomenon itself fascinated earthers of the period. It was Charles Fort who coined the phrase "teleportation." which describes the transportation of a person or object from one place to another. So what actually happened on that fateful October day in 1593? One particular noteworthy case occurred involving witnesses and a uniformed imperial guard appearing in Plaza Mayor in Mexico City. It was all very mysterious indeed. The guy was recognised as a palace guard for the Governor in the Philippines capital, Manila, people recall the poor chap looking dazed and confused. All of a sudden he appeared out of no-where in the bright light of day. When the villagers asked him who he was, he identified himself as Gil Perez. However he explained, he didn't understand how he ended up where he was. Gil Perez volunteered that the Governor, Gomez Perez Demarinas had him duly prepared for the block and gave the order to have his head taken off! It was truly Gameover! Curtains time! His executioner wore a hood and Perez heard him sharpening his axe as he ascended the wooden staircase to take his position before the jeering spectators. The executioner was a large and intimidating man but surprisingly he knelt down before him and asked for his forgiveness. Perez assured the executioner that he was duty bound to obey the Governor and no dishonour would befall him for performing the duties of his office. It was time. The hatchet man nodded and stood up. Perez realised that the razor edge blade of the axe would soon sever his head from his body, provided the axeman didn't botch the job. Later the Governor himself suffered an ill fate. Suffice to say no-one believed Gil Perez's story and he was arrested as a deserter and chucked in jail. However upon close scrutiny his story actually held up. Records dating back to 1698 documenting this highly unlikely case were written by a religious historian. More witnesses testified that yes, he was seen on duty as a palace guard the day before his mysterious appearance in Mexico. Why Governor Demarinas took a dislike to his guard, who knows? Gil Perez was sent back to Manila to retake his position as a palace guard and lived a seemingly unadventful life ever after. Believe it or not actually. These are actual real life events! LMAO It seems like some is having a laugh but one thing is clear. The records while contentious are indisputable. My post gives an accurate account of teleportation in 1593 which transpired in Mexico City. Live Long and Prosper Trekkies, Niners and Trekkers! Enjoy Your Star Trekking. The Andromeda is the largest galaxy neighbouring our Milky Way System. The Milky Way which encompasses our solar system made up of stars, space dust, gases and all that other wonderful stuff, is where our harmless little world is. The width of the Milky Way disk is 100,000 light years accross. When I started out reading about the universe, the word disk, sort of stuck out. Disk includes everything in a galaxies system, right down to the space dust. Some Stars also have disks with floating debris and space dust orbiting around them, which were once planets. The Andromeda disk is 260,000 lightyears accross, which means that not only would it take 260,000 earth years for a light beam to travel from one end to another, but it is about three times bigger than our own milky way galaxy. Theres very definitely intelligent life out there! Imagine what they could be getting up to. For the full article click on the link below. Ensign bring us about Bearing 330 mark 15 engage. We've heard Captain Picard giving these orders on the bridge of the Enterprise, but what does it mean? 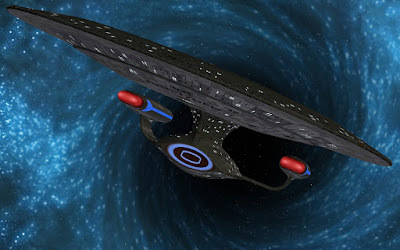 The term "Bearing" is a mathematical expression which Picard gives as part of an instruction to the helm. This alerts the ensign or navigational officer of his intent to change the direction of the Enterprise from its previous heading and redirect the flightpath of the Enterprise towards the direction of the other spaceship, which is most likely visible on the viewscreen. A bearing measures the angular difference between the current forward direction of the spacecraft (Enterprise in diagram) and the direction being described. (Khan's Botany Bay ship) The first number in a bearing of 000 mark 0 describes the direction, directly ahead of the vessel. The second number in a bearing of 330 mark 15 describes the direction to the port side ( look right) of the larger ship (Enterprise) which is the elevation value of the Enterprise towards Khans Botany Bay vessel, right above the centerline of the ship. When the mathematical expression "Heading" is given this describes the direction of the Enterprise not in relation to any other ship or object, but to a region of space. 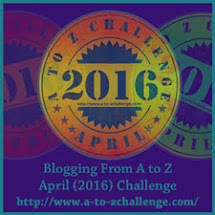 A Heading is composed of two numbers representing an azimuth value and an elevation value in degrees. 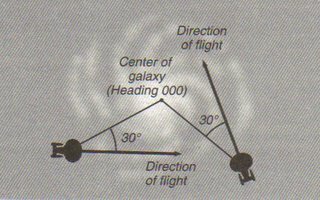 The numbers 000, mark 0 describe the ships direction towards the Geometric Center of the Galaxy. The ships degrees are from 0 to 360 in a clockwise motion and encircle the vessel. Paramount Pictures or CBS Paramount Television. Stars and planets are also used as a reference guide by starships to identify a location in space or set a new ships flightpath. 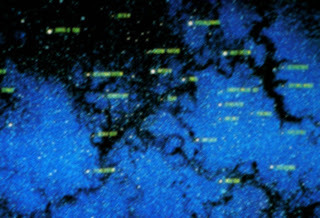 Federation starship computers can immediately set a ship's course direction in space, based on previously explored and mapped positions of interstellar "space bodies" otherwise known as planets, stars and even asteroid belts. Verbal navigational mathematical instructions given by Captain Picard to the conn, have advantageously altered the U.S.S. Enterprises NCC 1701-D bearing and elevation in times crisis with enemy ships, thus averting disaster for the entire Enterprise crew. 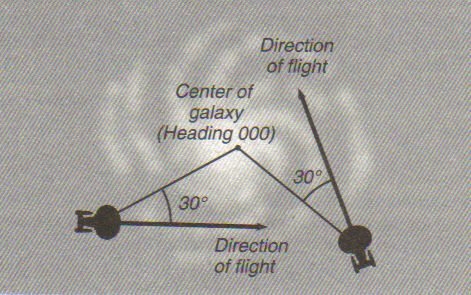 The center of the Galaxy 000, mark 0 is also used as a reference point when calculating the direction of the ships Direction of Flight towards another region of space. 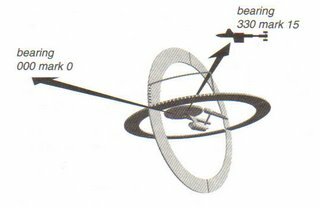 In the diagram with the U.S.S Enterprise NCC 1701-D and the U.S.S Yamato NCC 71807 both have an azimuth heading of 030. Full phasers, Fire! 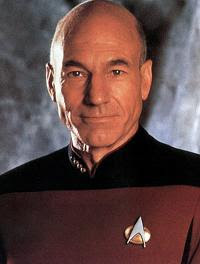 Kirk never disappoints, Picard dithered, hailed the mystery ship and asked for suggestions, not so Kirk! The Enterprise-A moved in slowly to zap possible Federation spies and then Kirk barked the order Fire! Lay down a pattern! Fire! Kirk phasered his way past a formidable, potentially dangerous spaceship, blocking his ships flightpath. Fire first, questions later. You cant help but laugh. It seems highly unlikely that a smaller less powerful starship could beat the blue blazes out of Captain Picard's Galaxy Class U.S.S. Enterprise, but Kirk wasted no time with the "enemy unknown." I loved it. Captain Picard must have been sweating big time! Have fun watching the battle of wits, between both captains of the Enterprise! In this photograph the Gorn Lizzard almost looks alive. Look at all those sharp smiling teeth. Gorn seems amused by whats going on or maybe hes just waiting. One false move by the human and we might just see Mr lizzard licking his lips. Our green friend definately has something in store for this trusting, unsuspecting, Sci-Fi Fan. In this photo the Earthling seems to be having fun with the Reptilian Creature. Where do you think it was taken? The creature seen here was the main star attraction in the episode " Devil in the Dark" in Star Trek The Original Series. The "Horta" was a creature of deep passion from the depths of converging caverns on Janus VI She was a protector, capable of striking in a flash with lightening stealth, melting all and everything that was in her path. She was also a highly intelligent lifeform, suffering from great pain and tormented with memories of sorrow and loss. The Horta is a remarkable, durable creature of the caves and readied herself to exact punishment on those who were ruining her childrens future. One by one, the miners of Janus VI started to die. This episode is filled with interesting characters, ranging from a panic stricken guard whose left abandoned in the caves on watch to a blunt, tense, almost angry Administrative Head /Chief Engineer fed up of watching his men dieing. This is a great episode. Tensions and emotions are running high because people are fearing for their lives. Emotional outbursts are commonplace with even the logical Mr Spock having a few for himself, over Kirks safety. This is a charged exciting storyline that just sweeps you up and takes the viewer on a trip of discovery along with Kirk, Spock and the rest of the baffled miners. There is a mystery here to be solved and no one has any answers, which is why the USS Enterprise 1701 is called to the rescue! "Mr Vandeburg, What is this?" "Its a silicone nodule, theres a million of them down there of no commercial value." comes the reply, rather bluntly. "A few trace elements, look we didn't call you here so you could collect rocks"
Vandeburgs appalled by Spocks carry on and is now looking at Kirk. Clearly, his nerves are on edge and Spock so far, hasn't done anything to inspire the chief. Theres an almost amused look on the captains face. If the Janus VI crisis wasn't so serious, these two, Spock and Vandeburg would be funny.- Kirk sees the need to lower Chief Vandeburg's blood pressure. "Thankyou Mr Vandeburg, we'll need your complete cooperation"
"You'll have it, Just find that creature or whatever it is, I've got a quota to meet!" Vandeburg leaves the room.
" 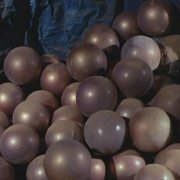 dealing with a silicone creature from the deep rocks"
So much is unknown about the "Horta" at this stage. Kirk is harsh. He has to be. The security guards are standing to attention. "You will proceed from level to level" - searching for the creature " and remember 50 people have died, I want no more deaths"
"Except the bloody thing" blurts out Chief Engineer unhappily. "So it is wounded and twice as dangerous, stay in pairs, if you see it, concentrate your phaser fire at what appears to be its head. Concentrate it, maintain it. It is definitely resistant, if it can be hurt, it can be killed. Administrative Head and Chief Engineer of the mining facility. Mr Vanderburg. "When that creature appears men die"
" I don't know what this butchering monster is, but I know what its doing"
"I'm concerned with my people here Kirk, they're being murdered, now you find that monster and kill it!" Human activity mattered little to the Horta until that faithful day of heartbreaking discovery. There was a lasting peace on the Horta Homeworld for thousands of years. So why did the Horta resort to murder? She was the mother of her race, left behind to care for her unhatched little ones on Janus VI. The Horta came from a time when thousands of her kind lived. Every 50000 years, all but one Horta passes on, who cared for the next generation hatchlings. This natural environment underground was their nursery "chamber of the ages" which until recently had been undisturbed for millenniums. One day as the silicone caretaker went about her business, disaster struck. The sound of equipment could be heard, which her finely tuned senses picked up on. Panic stricken and engulfed with feelings of Hortadread for the welfare of her little ones safety, the Mother Horta rushed to the Chamber of the Ages. Smashed eggs could be seen in the cave. The murderers had left. The Peace on Janus VI was over. I hope you enjoyed reading. Live Long and Prosper! 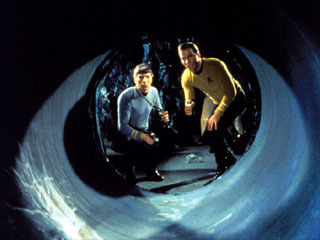 Spock and Kirk discover a newly cut tunnel in the last two minutes after the Horta fled after their first encounter. Northern Star Trails Park Algonquin. "Sammy, I'm going to need all the power you can muster, mister"
"Captain Nine Billion all Borg!" Its new territory now. A few clicks behind, the good guys ship is rendered powerless by the arresting space phenomenon and is pulled in by the menacing whirlpool of sparkling stars. The Borg have vanished and Earths timeline has drastically changed. Borgs everywhere - not a human to be found! Spinning out of control our heroes are caught up in the gravitational pull of the vortex...One by one, starship systems shut down as main power is lost due to the overloading of the ships engines. The chief Engineer slams her into reverse and desperately trying to escape the gravitational pull. Its too late, the magnetic star trails of Algonquin have engulfed the entire ship. High above in the sky is the Northern star which shines bright and never moves. This image is not to be mistaken for an artists impression either. 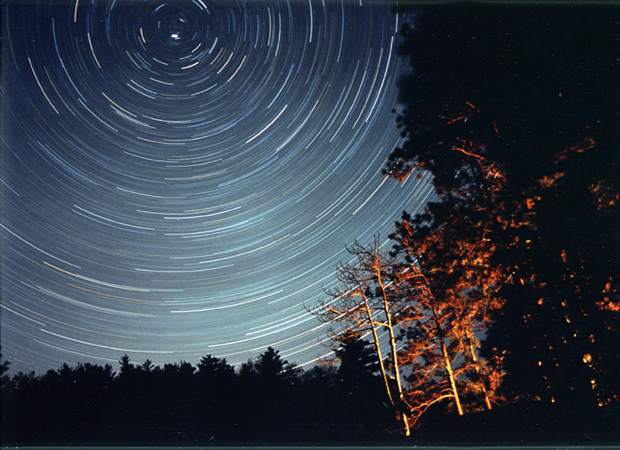 Its a real photo of Northern Star Trails in Algonquin Park. The trees look alive with reflection of the light in the night sky. Imagine being there at night on your own! 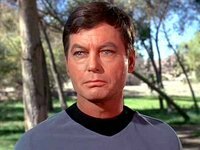 Dr Leonard H. McCoy is the chief medical officer of the USS Enterprise 1701. He is an emotional, illogical, country doctor who doesn't mind having the odd sip of Saurian brandy between patients. Sorry about the illogical bit, blame Spock. 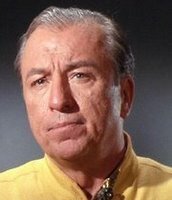 Dr Mc Coy also called "Bones" affectionately by Kirk, is highly respected and as of 2267, had earned the Legion of Honour, and was decorated by Starfleet surgeons. Spock, however would invariably antagonise McCoy, refering to the good doctors concoctions, magic potions and latest victims. So what did that make Dr McCoy? he's a man of science too, highly qualified and decorated. Spock is well known for his statements of logic and analyical prowess like the one above. Which he has unashamedly announced in front of Dr McCoy. Was Spock having fun at the doctors expense? How much of the human is speaking out? Was Spock actually enjoying himself? McCoy has countered Spocks own brilliant attestments of logic with a healthy dose of scepticism. "In a pigs eye!" stirs McCoy, hoping for an emotional outburst from Spocks human half. "That is a human emotion " is Spocks clever response. "You bet your pointed ears, it is!" Comes the warm human reply from Bones. 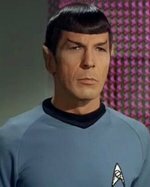 The camera focuses and we see a look of astonishment on Spocks face and the famous arched eyebrow is raised. Left alone Spock and Mc Coy would love to torment each other to bits using humiliating jibes and tear downs. When these two are at each others throats, with Kirk as referee, it makes for great laughs. I wonder does Spock ever breathe a deep sigh of relief and say "Great" (to himself)when DrMcCoy leaves the Bridge to go back to his Sickbay. But that would be so human and illogical. Personally, I think Spock knows that Dr McCoy is on to him. Poor Spock is half human and half vulcan and our good 'ole Dr Sea Bones doesn't let up on this. The cool calm exterior of our first Officer, doesn't fool the ship's Chief Medical Officer. Deep inside, McCoy knows Spock is struggling with the stern discipline of Vulcan Logic and the emotionalism of his human side, which Bones has played around with occasionally, much to the vulcans embarassment. 1)medical scanners. These were used to take readings of a persons vital lifesigns. The device itself is cylindrical in shape. 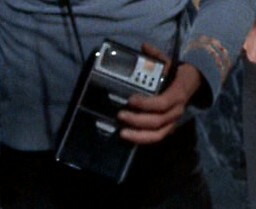 In the image opposite is a pair of hands and a medical tricorder. The right index finger is resting on the silver scanner, which is then taken out and used to diagnose. 2)Medical Diagnostic Bed with the overhead scanner. Its been rumoured that NASA were facinated with the orange bed covers in The Uss Enterprise 1701 Sickbay and at the time had a good look at them. 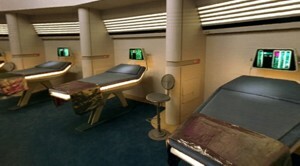 Here you have 24th century biobeds . Image copyright belongs to Paramount Pictures. 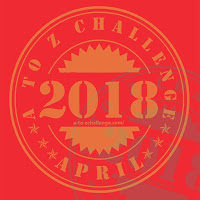 Star Trek T.O.S. Memory Alpha. 3) A Surgical support frame is equipped with a sterilization field, cardiostimulator and other inbuilt support functions for surgical procedures which assist the surgeon when operating. Here you can see a 23rd century biobed with overhead scanner also. Usually there is a cute nurse on standby also to help in the surgical procedures. It looks like the patient is ambassador Sarek, another of the good doctors victims. We all know whose words those are! 4) Dr McCoys Hypospray! Never beams down without it. This medical instrument was used by Mc Coy to administer "stimulants" such as cordrazine to Lt Sulu, who suffered serious electrical burns on the Enterprise Bridge in 2267 This device later became an inspiration to "real world engineers" who have since invented medical devices based on these designs. 5) Cordrazine. Lifesaving medical wonder drug treatment, used to treat life threatening illnesses, burns etc. Beverly crusher administered 25ml of this drug to Worf in a last ditch effort to save his life when , (as Q has put it- entertainingly) under the inept ministrations of the Doctor Crusher - everything else failed. 6) Psychotricorder-This is an instrument used to record past memories. 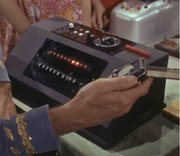 Kirk ordered a 24 hour regressive memory test on Chief Engineer Scott, to help clear him of murder on Argelius II in 2267. Chief Engineer Scotty. Wolf in the fold has an especially humourous aspect to it. Scotty is always not far from the crime scene and that "voice" just cracks me up. 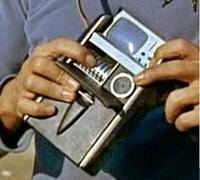 7)Dr McCoy's Biocomputer was an independant piece of computer technology capable of analysing and isolating complex medical problems/viruses etc and obtaining a vaccine using totally logical means. The computer doesn't have an interface with the Enterprises computer, so the results have to be fed via the communicator to the sickbay labs above where a formula is processed. Wow you read this far! Thanks for stopping by. Live Long and Prosper Trekkers!! Khan Noonien Singh the ex-prince of Earth's millions, how that must have hurt. Genetically engineered and Superhuman, this merciless, charming, cutthroat was on a quest for revenge. People who stood in his path were eliminated with the flick of a phaser or at a given command. He was ruthless, calculating, mentally superior, aggressive and ambitious. The perfect respected, ruthless, leader. There was a time from 1992 to 1996 when Khan was the ruling prince of millions on Earth. Where there was chaos, the prince offered order. He was a popular tyrant who ruled fairly and was worshipped by one quarter of the planets population. Khan's fellow super humans meanwhile were busy changing the balance of power on earth, fighting and enslaving the population. Except for Khan's corner of the world, hostile warring became part of daily life. Eventually Khans luck ran out. For four years, the supreme commander, His Excellency, dictated order to his Kingdom of People on Earth. In 1996 Earthlings opposed the super humans. Khan was stripped of power, defeated and humiliated, along with his remaining sworn to die subjects. They evaded capture by fleeing the planet aboard the S.S.Botany Bay. 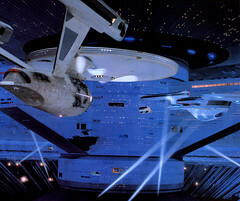 The starship displayed here is USS Enterprise NCC-1701 constitution class. After her historic five year voyage, she returned intact to Earth. Kirks gallant crew of explorers rose to the status of living legends, with a following of fans in their millions, well known across the galaxy today. Spaceflight gained popular momentum on Earth with these powerful Federation vessels in service. Starfleet Command had to swallow their secret plans to decommission this twenty-five year old Federation Flagship due to the fact that the Enterprise had become legendary. The Admiralty approved a refit for political reasons giving the USS Enterprise NCC 1701 the full green light! Soon word spread throughout subspace. Starfleet's Core of Engineers were being dispatched to the U.S.S. Enterprise NCC 1701! The Enterprise refit was official now and no longer a joke at Starfleet Academy. Scotty's beloved engines were being pryed apart by engineering outsiders. The Core Engineers carefully decommission vital mechanisms of the warp engines in which matter and antimatter are combined safely eliminating any danger of a warp core breach. Another Engineering team moves in and installs the new FWG-1 warp engine components under the watchful eyes of Scotty who scrutinizes their every move. 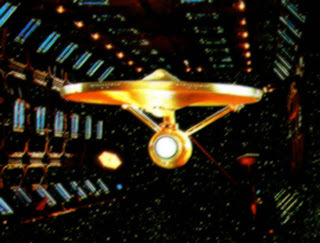 Captain Kirk's Enterprise was in dry dock, and was living proof of an outstanding success story in the eyes of the enchanted people of planet Earth. It was important no-one goof this up because at the time the Enterprise was a remarkable symbol of hope for all humanity. Paramount Pictures and/or CBS Studios. Instead of dismantling the ship, Starfleet finally approved Enterprise's refit which was long overdue. Since 2190 when she was launched into the mysterious depts of space and the great unknown, the USS Enterprise 1701 couldn't spare the time for a full refit. Instead she returned to starbases to have her systems periodically repaired and updated. Four overhauls were carried out but now the ship technologies were obsolete. Chief Engineer Scott and the Starfleet Core of engineers oversaw refit of Enterprise. Leeding Engines Ltd were chosen and given the contract to install the new FWG-1 warp nacelles which replaced the old Shuvinaaljis Warp Technologies Model FWF-1 nacelles which had faithfully served the Enterprise for the last 25 years. Federation Starships, Federation Planets, Federation Star bases, Federation Spy posts, Federation Involvement, Federation do-gooders and overhead fluttering in the breeze the flag of the UNITED FEDERATION of PLANETS. All of this pomp and ceremony, Khan couldn't have cared less. His days of leadership brought him back to a daydream when it seemed he had the power to control millions. Khans Kingdom predated even the mighty Federation. However, Khan's current location on Ceti Alpha V bugged him the most. The planets twin Ceti Alpha VI blew up and affected the orbit of Ceti Alpha V turning it into a barren sand heap. The living conditions were horrible for Khan and his dear wife who died a slow death traced to one of the planets indigenous lifeforms. The Ceti Eel. The Ex-Prince of Earth and ruler of Ceti's sand dunes couldn't fathom why Captain Kirk did not check on their progress. 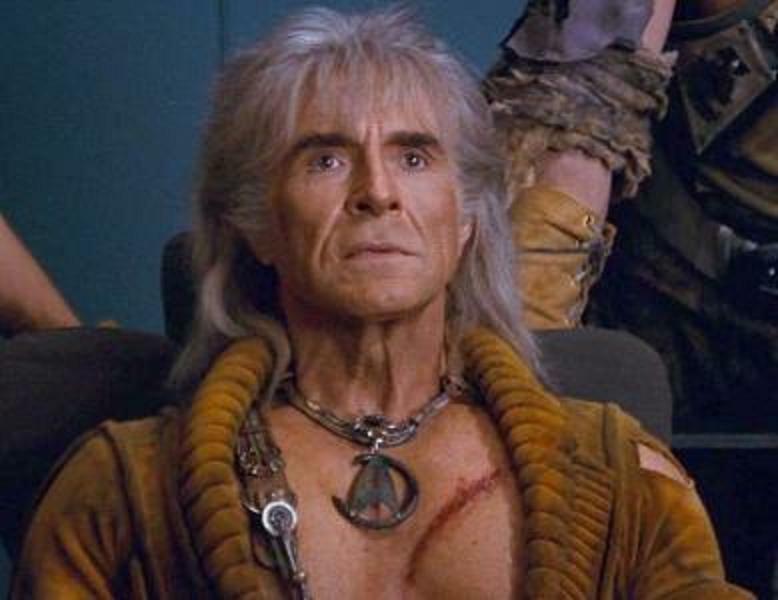 Khan vowed to escape Ceti's dunes before he and his Botany Bay followers perished on Ceti Alpha V for good. When The USS Enterprise NCC 1701 first encounter Khan and eighty of his crew on a sleeper ship, the SS Botany Bay, Captain Kirk's landing party awakens them from their cryogenic deep sleep into the 23rd century. That was Kirk's first mistake. Khan attempts to take control of the USS Enterprise and when he fails in his bid to murder James Tiberius Kirk, Khan is exiled to Ceti Alpha V. Kirks Enterprise deposits Khan, a now stripped, powerless leader of nothing along with his loyal band of subjects, who accompany him to the new fruitful, bountiful planet. Marla McGivers goes with Khan to be his wife with ambitions of creating a new civilisation and starting a family which all turned to dust six months later. The ex-ruler had a dream of creating a new world order, which was destroyed forever more when Ceti Alpha VI blew to to bits. What is the meaning of this attack? Where is the crew of the Reliant? "Khan , you bloodsucker, you'll have to do you're own dirty work now! do you hear me? do you?" Earths thoughtful Tyrant of world order is swamped with feeling towards Kirk. Circling high above the planet in the Reliant, Khan has good reason for pause and is in deep reflection. His eyes roll in his head in sheer awe and wonder at Kirks continuous lucky escapes. Khan decides to keep Admiral James T Kirk talking until he gets the co-ordinates of the Federation's Genesis "Doomsday"Device and beams it aboard the Reliant. "KIRK! Kirk you're still alive - my old friend...." affection can be heard in the Princes voice. "Still OLD FRIEND! You've managed to kill just about everyone else, but like a poor marksman, you keep missing the target!" 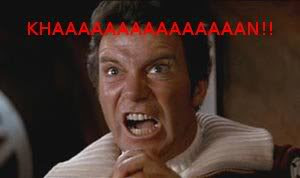 responds Kirk , clearly enraged by Khans wrathful ways. "Perhaps I no longer need to try! I shall leave you as you left me marooned in the centre of a dead planet....buried alive!" declares an avenged Khan who says no more. Live Long and Prosper, Trekkies, Niners and Trekkers! Kirks Ghost or is Picard Hallucinating? 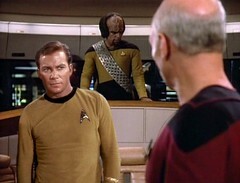 Captain James T Kirk is eyeballing Picard and the TNG captain is holding his ground, staring back. Clearly Picard is hallucinating. Worf doesn't seem that bothered by the arrival of our maverick Captain Kirk and Security haven't been called to the rescue. So this is further evidence that Kirk isn't here. The burdeons of command must be getting to Jean Luc, which only proves hes flawed like the rest of us humans. It does however confirm a suspicion, that the heroic Captain Picard has been feeling confused. With the arrival of Captain Scott aboard the Enterprise,( Scotty was reported missing 75 years earlier and discovered by the Enterprise aboard the Jenolen, locked inside a transporter beam diagnostic cycle.) Picard sought out Captain Montgomery Scotts company on the holodeck. I remember the expression of awe and wonder on James Doohans face as Scotty saw his ships bridge again. It was a magical moment, for him and for the fans. Trully special. The sheer delight and yearning for the past with his old crewmates, it must have evoked, in Mr Scott followed by sadness and anger as he left, was felt by all Star Trek fans everywhere watching "Relics" that day, to be sure. On her five year mission, the USS Enterprise 1701 commanded by Captain James T. Kirk with Mr Spock as his Second Officer, encounters a massive asteroid belt but rather than go around it, she decides to phaser fire her way through the space debris. 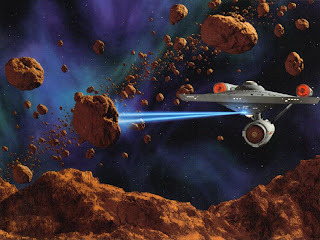 This is one of my favourite desktop wallpapers which I found on an excellent Star Trek Wallpaper Website. Just point and click at the Enterprise 1701 and she'll take you right there! Live Long and Prosper Trekkers! Enjoy Your Star Trekking! Here is the Federations finest, U.S.S. Enterprise NCC 1701-A commanded by Captain James T. Kirk. The Enterprise barely escaped doom from total destruction and with battle damage repaired, she returns to spacedock after a murderous firefight inflicted by Khan and his merciless band of merry men and women! Look at the damage, the Enterprise is black and blue, from the thrashing Khan gave her.
" But they're travelling without shields" queries a bewildered second in command. "Yes of course, we are all one big happy family" predicts the exhiled Prince of millions, with fondess. "They're hailing us" informs the Khan subordinate. Look at the colour of the ship. The ship got roasted by Kirks old friend and was badly crippled. Imagine being a young ensign or any member of crew, stuck inside the Enterprise as Khan did his utmost best to blow her to bits. The ship was full of trainees, inexperienced, and faced with the first battle of their young lives. One can only imagine the panic, as trainees scrambled for cover, desserting their posts, fearing for their lives with explosions going off, inside and outside the ship. Fires and electrical shortouts had nightmare consequences with safety doors sealing off decks, slamming down and trapping crew. Without drastic action the ship would destabilize and more lives would be lost. The noise from Khan's phaser blasts must have been very scary and deafening without the shields protecting the hull of the Enterprise. "Is the word given Admiral," asked Scotties dying nephew. Thinking his comrades safe, the ensign slipped into a peaceful long sleep. "He stayed at his post, when all the other trainees ran" explained a distraught Chief Engineer Scott to Captain Kirk. These are the dangers and voyages of The Starship Enterprise. Live Long and Prosper Trekkers! Yeti takes a road trip! Smiling at you in the mirror is a gentle hearted critter, making his way to Kansas! His name is Yeti and he's a hairy snowman, a good spirited alien determined to reach the people of Earth. Yeti has been seat belted carefully into the passenger seat, by his driver Marcus, isn't that thoughtful? The cars behind are trying to catch up, giving chase, odds are, they could even be the paparazzi. Yeti has become somewhat of a noted celebrity recently, since anouncing his existence to Earths ball of beings in July, '06 and leaving behind his unhappy, gloomy life in the Himalayas Mountains. Yeti is happy to take a breather and keep an eye on the car chase at the same time, as his chaufeur driven car makes its speedy getaway. The temperature of the car is cool and the radio is playing but somehow the cars behind are playing on the snowmans mind.Yeti is a naturally shy creature of habit, used to crouching and hiding from humanoids. Nothing to fear here. Specific instructions have been given to Marcus (A Dodgems Driving Pro) by Yeti's agent, Michelle, to give these scallywags the slip, only when neccessary and without speeding.
" Yeah, right" says Marcus to Yeti, fuming as they drove away in the car.
" What Bananna tree does she think i fell off ?" Marcus enquired feelingly.
" Michelle just doesn't want you practising your dodgem skills, with me in this car, but she knows you're the best in the business!" explained Yeti, chuckling momentarily.
" You better believe it son, i'm Mr Speedy Gonzalles, Mr Quicksilver, Remember Roadrunner? That was my favourite cartoon growing up!" answered Marcus gleefully.
" Theres no TV in the Himalayas Mountains remember?" prompted Yeti.
" O, Yeah " Replied Marcus, feeling cranky. Weary of all the previous days interviews, cameras and flashing lightbulbs, but still delighted with his new found stardom, Yeti is looking forward to spending time with his human friends and giving graphic details, of the exciting high speed daring car chase and the growling of the cars V8 engines. The prying eyes of the paparazzi were hot on their tracks. Yeti found it fun watching Marcus wrestling at the wheel of the big car and ditching the entourage of cars at the railway tracks in a cloud of dust. Some of the Paparazzi guys got out of their cars, defeated and looking very gloomy indeed. They continued walking in circles with their mobiles pressed to their eardrums. Others Just stayed in the car with mad furious looks of rage on their faces, at being cheated, grinding their teeth silently. Some even banged the roof tops of their cars in sheer frustration at being stranded at the train lines, with the Express Delivery Train speeding along blocking their path. "It was hilarious, You just had to see them. " chortled Yeti " We actually waved goodbye! "